PULLMAN, Wash. – The number of planets in the Milky Way galaxy which could harbor complex life may be as high as 100 million, Washington State University astrobiologist Dirk Schulze-Makuch writes in a column posted this week on the Air & Space/Smithsonian magazine website. The estimate, which assumes an average of one planet per star in the Milky Way, is drawn from a study believed to be the first quantitative assessment of the number of worlds in our galaxy that could harbor life above the microbial level. Schulze-Makuch said the study is significant because it is the first to rely on observable data from actual planetary bodies beyond the solar system, rather than making educated guesses about the frequency of life on other worlds based on hypothetical assumptions. The research was published recently in the journal Challenges by a group of scientists that includes Louis Irwin, of the University of Texas at El Paso; Alberto Fairen of Cornell University; Abel Mendez of the Planetary Habitability Laboratory at the University of Puerto Rico at Arecibo; and Schulze-Makuch. The researchers surveyed the growing list of more than 1,000 known planets outside the solar system. 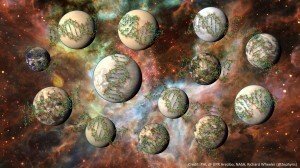 Using a formula that considers planetary density, temperature, substrate (liquid, solid or gas), chemistry, distance from its central star and age, they computed a “Biological Complexity Index (BCI),” which rates planets on a scale of 0 to 1.0 according to the number and degree of characteristics assumed to be important for supporting various forms of multicellular life. He emphasizes that the study should not be taken as an indication that complex life actually exists on as many as 100 million planets, but rather that the figure is the best estimate to date of the number of planets in our galaxy likely to exhibit conditions supportive to such life. “Also, it should be understood that complex life doesn’t mean intelligent life or even animal life, although it doesn’t rule either out,” Schulze-Makuch said. “It means simply that organisms larger and more complex than microbes could exist in a number of different forms, quite likely forming stable food webs like those found in ecosystems on Earth. And most planets with a high BCI are much farther away, he said. If the 100 million planets that the team says have the theoretical capacity for hosting complex life were randomly distributed across the galaxy, Schulze-Makuch said they would lie about 24 light years apart, assuming equal stellar density. And he estimates the distance between planets with intelligent life would likely be significantly farther.